Before the event, your goal is to create anticipation towards it and boost attendance. To do that, invite your social followers to the event. Accompany the invitation with compelling messages, creating a sense of urgency, such as “Save your spot!” or “Register now!”. You can go as far as offering tickets to the event to a few lucky followers. Though more common in the B2C realm, those kinds of social media contests have been readily embraced by B2B brands, like many other B2C trends. 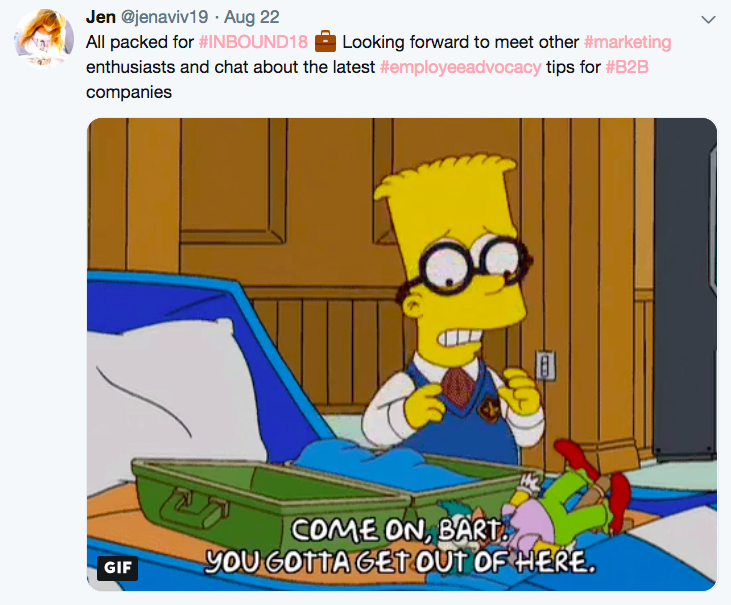 Remember that interactivity goes a long way in engaging your followers and will make them intrigued to find out more about the conference or even attend it. Events make for great social media content. They diversify your content pipeline and create a sense of excitement and relevancy around your brand. To capitalize on those emotions, share teasers before the event. You can create customized visuals showing a countdown to the event, or an abstract of the talk your speakers will be giving. Another type of content can be a video documenting the internal preparations for the conference, with short sound-bites of team members attending it and sharing their excitement. 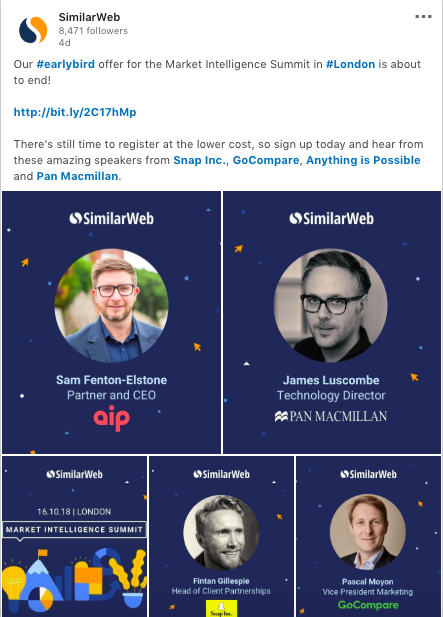 These kinds of teasers will ensure that your followers are eagerly waiting for the next piece of content about the conference. Social video is the perfect fit for events and conferences. Do you know the saying “You had to be there to believe it”? Video allows your followers to get as close as possible to “being there”. It’s also more effective than other types of content, as evidenced by 71% of B2B marketers reporting that video converts better than other formats. Make sure to capture the dynamics of the conference: the crowds, the applause, the greetings. Emotional marketing is paramount here, and inspiration is key. Integrate inspiring music with compelling quotes for an engaging video that will give your audience a taste of the event. Pre-recorded video is great, but there are additional benefits to going live on social media. Your audience craves fresh, exclusive content, and going live is just the thing to quench this thirst. Another reason to go live is the Facebook algorithm, which prioritizes video in general and live video in particular. You can broadcast major news announced at the event or interesting demos and talks. Creating a video in which your team members comment and give their own spin on the events is another type of content that will engage your followers. Be original and offer insights that have industry-wide significance, while asking your audience to share their own. This way your audience will feel they’re getting to take part in an invite-only event and respond with enthusiasm. Don’t wait until the end of the event to give your audience an update. You can easily tweet from the panels, sharing memorable quotes and giving your audience a sneak-peek into behind-the-stages moments. To amplify your social media posts, make sure to use the conference hashtag and mention the conference profile. You don’t necessarily need to stick only to your company’s speakers. Giving a shoutout to other companies – and mentioning their handles – will give your posts more visibility on social media. The companies you mention are likely to share your posts about their speakers, which will further boost your following. Employee advocacy is a great tool to leverage events on social media. Provide your employees with content which they can share – images, videos, inspiring quotes- and encourage them to share the excitement with their social networks. Advocacy can yield great results before and after the conference, but it’s particularly effective during events. It can attract prospects to your booth and assist your sales reps in setting meetings with buyers. Advocacy posts can also increase the attendance in your panel or talk. The authentic voice of employees, sharing their experiences with their networks, will boost the value from any given conference. 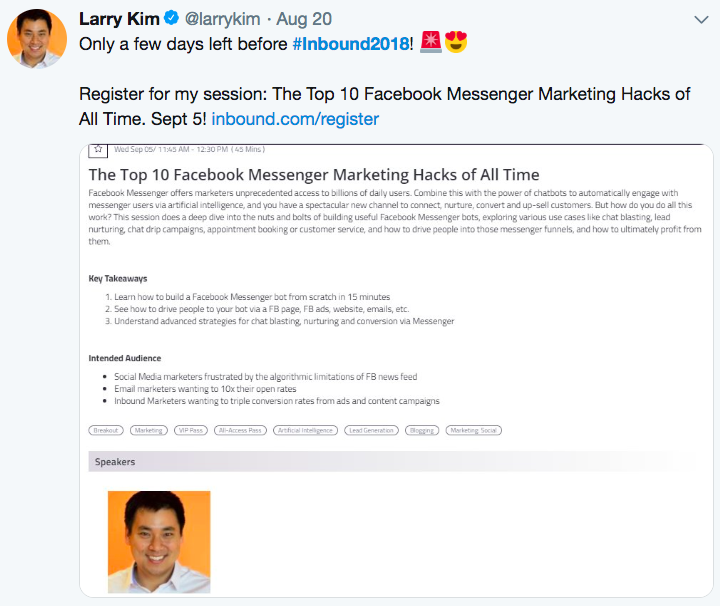 There is a way to leverage an event on social media even after it’s over. Publish a takeaways post and tell your audience what you’ve learned at the event. You can recap the news and product launches announced at the conference or make a list of interesting talks that inspired you. Your takeaways post needs to bring value to followers who didn’t attend but are interested in discovering the insights you were able to uncover. Focus on insights with high relevance to your audience, rather than bringing them an unedited mix of speakers and panels from multiple industries. Adding your personal take on the trends and opinions you’re bringing will provide more value to your posts. Social media marketing is the perfect partner in crime for industry events. You can use social media to boost participation in your panel or talk, increase engagement around your content with compelling behind-the-stages videos, or demonstrate thought leadership by sharing trends from the event. 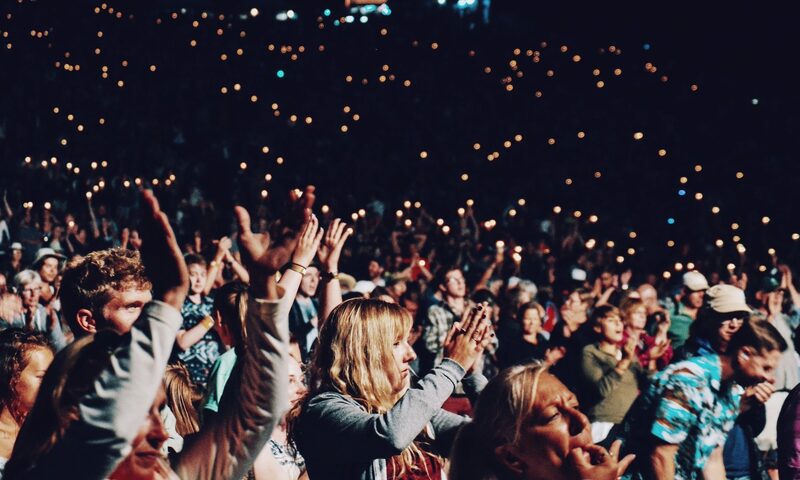 Social advocacy is a great way to not only leverage events on social media but also reach new audiences. 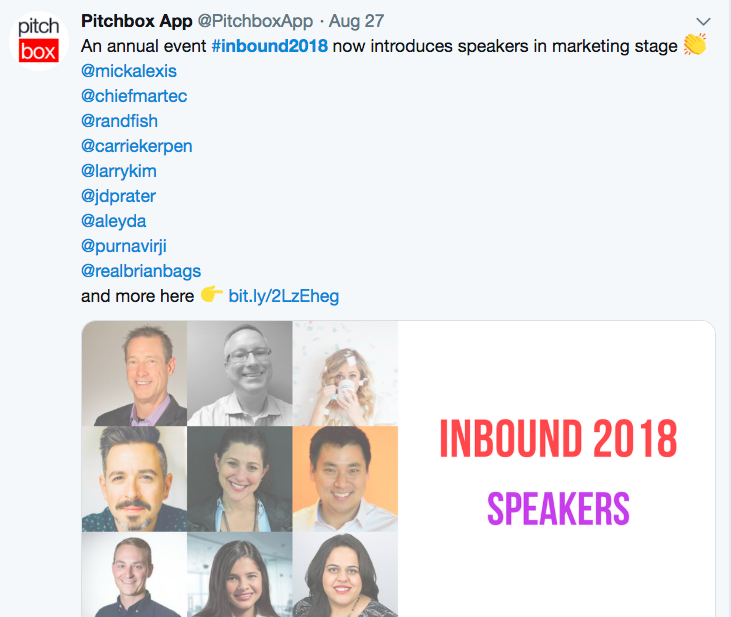 Check out Accelo’s case study to see how it was able to generate a 140% ROI with advocacy at HubSpot’s INBOUND annual conference.